3/20/2009Share this story on Facebook! Professor Barlas discusses the widening gap between Muslims and the West, arguing that the United States has taken advantage of the 9/11 terrorist attacks to bring war to the Middle East. Professor Barlas presents a histori­cal analysis of how discrimination against women has become justified and accepted among Muslims, and she provides a reinterpretation of the Qur’an to show that the holy text supports equality of the sexes. Professor Barlas examines contemporary politics in South Asia through the lens of its history of British colonialism, with special focus on military rule in Pakistan and electoral democracy in India. The international background of politics professor Asma Barlas does more than just contribute to her teaching style -- it’s a big part of what she teaches. In and out of the classroom, Barlas challenges her Ithaca College counterparts to examine their beliefs and assumptions and view the world through a global lens. Barlas grew up in Pakistan and studied English literature and philosophy before becoming a career diplomat in the Pakistani Foreign Service. Only the 13th woman to join, she was later fired for criticizing a military leader. She then worked for a leading opposition newspaper until she came to the United States to attend graduate school. She now has political asylum in the United States. A professor at the College for over 15 years, Barlas teaches a variety of politics courses, many of which focus on the Middle East, colonialism, and third-world politics. She emphasizes discussion rather than lecture in her classes and criticizes the idea that students are empty banks into which teachers make deposits of knowledge. “We engage in a process of dialogue with each other,” she explains. A passionate and often controversial scholar of Islam, Barlas has presented her work in coun­tries including India, Indonesia, Egypt, Spain, Germany, and the Netherlands. Her trip to Indonesia to promote her book “Believing Women” in Islam: Unreading Patriarchal Interpretations of the Qur’an was especially gratifying for her because so many Muslims there were open to her ideas. Indonesia has the largest Muslim population of any country, but most Americans associate Muslims only with the Middle East. Professor Barlas continues to travel to promote her reinterpretation of the Qur’an. She proposes a reading that supports gender equality -- a reading that has been controversial especially among Muslim men, who gain power from the current understanding of the text. But Barlas believes all people should be able to analyze the Qur’an. “No text has only one possible meaning,” she explains. 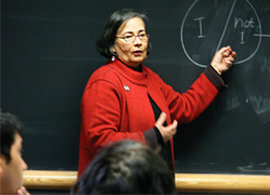 In addition to publishing numerous books and articles, Professor Barlas founded the Center for the Study of Culture, Race, and Ethnicity at Ithaca College in 1999. The center functions as a department within the College and supports the study of racial and ethnic groups that have tradi­tionally been marginalized, underrepresented, or misrepresented in our society. “I would like to see issues of race become more mainstream,” Professor Barlas says. Work at the center aims to incorporate these issues into the IC experience through academic activities, an annual lecture series, and two minors in the Division of Interdisciplinary and International Studies: African diaspora and Latina/o studies. Farther from home, the University of Amsterdam named Professor Barlas as its Spinoza Chair last summer, making her the first Muslim to receive this honor. While in Amsterdam as a distinguished visiting scholar, Barlas taught a graduate class, gave two public lectures, and participated in a debate with a male Qur’an scholar who disagrees with her views on women’s rights. “It was a very rich, complex experience,” she says. Professor Barlas is a role model who shows students how to challenge conventional view­points and speak passionately about equality and tolerance. As a scholar and teacher, her international experience brings a global con­sciousness to her students and helps them realize the ramifications of living on a planet with many cultures. As the world’s citizens become more like neighbors, these lessons couldn’t be more valuable or timely.